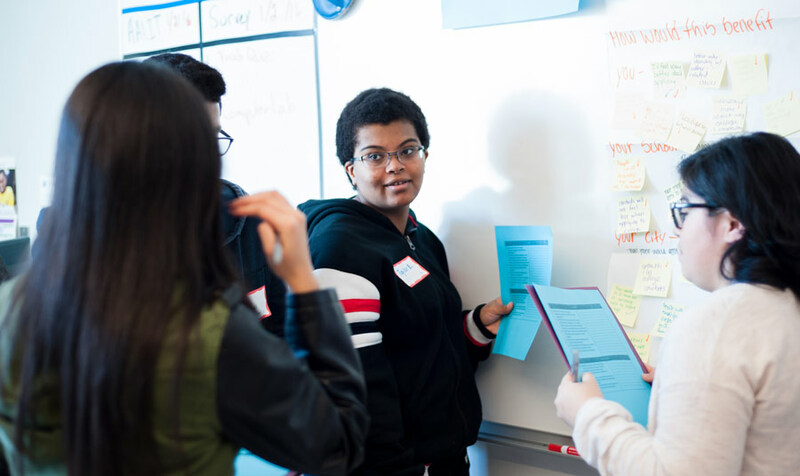 Mikva Challenge engages Chicago teens to identify issues that affect them—from policing to politics, health to housing—and develop policy recommendations for local government officials. Kevin Quiroz and other students from around the city discussed the distrust and misunderstandings that often arise between police and teens, as they gathered in the downtown office of Mikva Challenge this fall. "Police officers don't necessarily know what's going through the youth's head, and youth don't necessarily know what's going through the police's head," said Quiroz, 17, a student at Back of the Yards College Preparatory High School who wants to be a forensic pathologist. Hunched over laptops and scribbling on white boards while calling out ideas, Mikva students mapped out how they could develop specific policies to change the fractured relationship between police and teens. Mikva reaches out to schools, parole officers, nonprofits, and park districts to engage Chicago teens on issues that affect them—from policing to politics, from health to housing. Mikva's current students mirror the city's diversity. Forty-seven percent are Hispanic, 38 percent African American, and 10 percent white; roughly half come from neighborhood public schools and half from alternative, charter, selective enrollment, and other types of schools. The teens develop policy recommendations for local government officials such as Chicago Mayor Rahm Emanuel, Cook County Board President Toni Preckwinkle, and Chicago Department of Public Health Commissioner Julie Morita. Mikva Challenge organizes 200 students into nine different advisory councils, focused on topics such as enhancing public safety, improving public housing, and mending the juvenile justice system. Each team develops policy recommendations, which they present to the elected and appointed officials. We really want youth who are impacted by issues involved in them; they are the stakeholders who are [usually] never invited to the table. The city and county agencies typically agree to adopt some of the recommendations, and over the following year work actively with the youth to turn the policy recommendations into reality. Past recommendations that were adopted included creating the Expung.io app to help youth through the legal process of erasing their juvenile records; bringing mental health services into public schools; and making the Chicago Public Schools budget more transparent and accessible to students and the general public. "We really want youth who are impacted by issues involved in them; they are the stakeholders who are [usually] never invited to the table," said Michelle Morales, chief executive officer of Mikva Challenge's Chicago office. "It's really important, for example, that on the Juvenile Justice Council, we have youth who are court-involved. Because they just went through detention, they know the barriers, they know the experience, they know what we can do differently for future generations." By working with peers from different neighborhoods and backgrounds along with policymakers at the highest levels, students gain self-confidence and a broader perspective. "Before I got into Mikva I never knew I could actually do a lot of things and my voice can actually be heard," said Jaquion Dotson, 18, a student at Urban Prep Academies who helped hatch the idea for a "STEAM van," which would visit under-resourced communities to teach youth about science, technology, engineering, arts, and math. Mikva Challenge was founded in 1997 by federal judge, former White House Counsel, U.S. Congressman, and Illinois state legislator Abner Mikva and his wife, Zoe. Mikva Challenge was part of their long-standing commitment to opening up democratic spaces for youth living in under-resourced neighborhoods and communities viewed as politically "insignificant." While the organization has had a concrete impact on Chicago-area policy for years, it has also become a national model for civic engagement. Mikva Challenge now has programs in Washington, D.C. and Los Angeles and publishes a curriculum called "Issues to Action" that has been used by more than 1,500 educators around the country. "It's teaching them to seek out resources and ask the right questions," Moore said. "My job is getting them ready for the rest of their lives." Chicago Mikva Challenge participants said the experience has taught them not only about citywide policy issues, but also about better understanding and appreciating their own diverse communities and neighbors. "I used to be a bit prejudiced, admittedly. This program really opened my eyes," said Quiroz. "Mikva changed my life, kind of. Now I'm thinking more critically about how to interact with people all around Chicago." While Quiroz and other students work on policing, Blanca Vilella, 17, and her team are focused on how the Chicago Housing Authority can better serve youth who live in private housing supported by Housing Choice Vouchers. Vilella's team is working with the agency on revamping its website and social media presence to better connect with youth. "You have to put it in a way that we will stop scrolling and we will actually look at it," said Vilella, who wants to study political science in college. She added that the experience "showed me how to talk to people in power." Ruthie Moore, director of the Chicago Housing Authority Council, said that working with the housing authority gives students life skills applicable to a wide range of contexts. In 2017, MacArthur provided a $1 million institutional support grant to Mikva Challenge.